Your neck begins to sweat; the muscles of your chest imperceptibly pull back; you brace yourself against a wall, arms folded. Public art promises embarrassment as it leans toward revelation. In my experience, the two are usually inextricable. This is true for both artist and audience. I once happened upon a small crowd at the corner of 75th Street and Madison Avenue on a summer’s day in Manhattan. I looked up and saw a man walking with slow intent down the side of the Whitney Museum of American Art, perpendicular and assisted by only a single guide wire. When he reached the street he was instantly engulfed by an exuberant crowd. Only later did I discover it was part of a Tricia Brown retrospective and officially codified as dance. Another time, circa 2002, I was walking across downtown St. Paul when I stumbled upon a poetry slam taking place in a plaza shared by three skyscrapers. I was just giving up on slam poetry (and its concomitant embarrassment), but there was something revelatory about the surprise of this particular slam and how the amplified performances seemed to bounce off every glass window for hundreds of vertical feet. I put my name on the sign-up list and spit an epic spoken word manifesto as men in suits poured out of the buildings in search of lunch. I won twenty gold Sacagawea dollars and took my roommates to the movies. These experiences buried a need deep within me to create something public and a few years back, when my second book came out from Coffee House Press, I forwent a traditional book party in order to flood the Minneapolis skyways with a coordinated guerrilla reading. Just as the workaday world was rushing for their cars, 5pm on a Friday in the middle of a long winter, twenty different poets in twenty contiguous skyways simultaneously read my entire book of poems. As one of the readers, I can attest to the mixture of embarrassment, neglect, and occasional revelation that transpired, as a thousand corporate bodies woke (or didn’t) to the fact that the several people versifying in their skyways were possibly not insane, not zealots, but instead were bringing some kind of private art to these very public spaces. 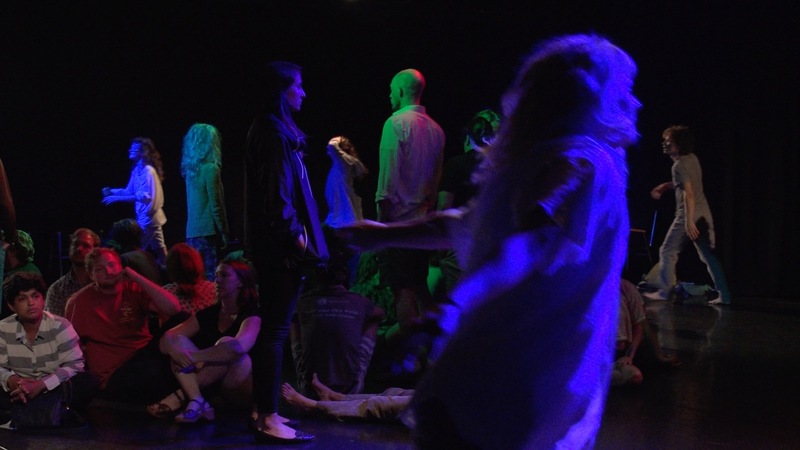 What makes these experiences different from BodyCartography’s closer, is that in all of them the audience and performer labored to maintain a consensually remote physical distance, which the art then attempted to bridge through aural or spectacular force. In closer, that distance is bridged and eclipsed through physical relationality, through the tension of embodiment, and it transforms both dancer and viewer until even that distinction becomes eclipsed and falls away. The first time I experienced the closer, my dancer (I want to say my partner) was Dolo. We met briefly at the BodyCartography table and after clarifying how she spelled her name we didn’t speak again until the performance (I want to say encounter) was over. She began walking away and through subtle, intermittent eye contact I knew she meant for me to follow her. This was (we were) taking place in the plaza across from the Convention Center, and although Dolo moved more like a flâneur than a conference attendee, she did not begin by “dancing” in any recognizable way. She strolled around the periphery until she found a tall row of tiger lilies. All her movements slowed until she was frozen in a dynamic sculpture of smelling a single lily. This was the first time I felt my mirror neurons fire. 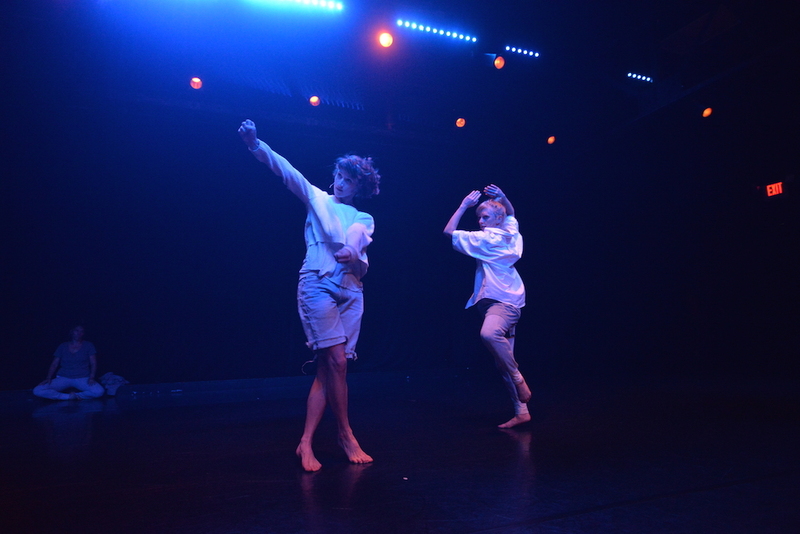 During most dance performances, I am aware of little responsive twitches happening all over my body, which is its (my) way of saying “I wonder what that feels like?” Watching Dolo, it was impossible not to wonder what the tiger lilies smelled like. This haptic engagement appealed directly to my sense of smell. When I leaned over to smell one, she reanimated, took a step back, and recreated the scene with one of her own hands as the lily. I couldn’t help but wonder again, feeling a little strange about it this time, what her hand smelled like. And before I could do the interpersonal calculus of figuring out whether it would be okay if I smelled her hand, she was off. And, following (flowering), so was I. As she jaunted across the plaza, I began to notice people noticing us. Did they think I was some creep following this young woman around the park? A man in a wheelchair inched around a light pole to get a better view. Whether I wanted to or not, I was flickering between viewer and performer. Even if I just followed Dolo at a safe distance and watched her move, others were watching me watching her, and looking to see what I thought of Dolo’s movements. This is a lifelong anxiety of mine. I’m standing at a rock show or pacing through a gallery and I suddenly feel like others are watching to see how I am performing my own enjoyment or displeasure. With closer, you have to confront that anxiety directly. It’s constituent to the piece. And while I was still subconsciously reckoning with this element, Dolo was busy dancing. She came nearer and then moved away. Her arms dramatized the peculiarity of having arms. Suddenly and literally she was running circles around my befuddled body. This was the first time I felt my will kick in. I didn’t want to be in the middle of running circles. I felt embarrassed, like an inert and unwilling performer, a prop. Half-defiant, I began running circles in the opposite direction around her. I felt her flinch as we nearly collided, and that flinch was revelatory. 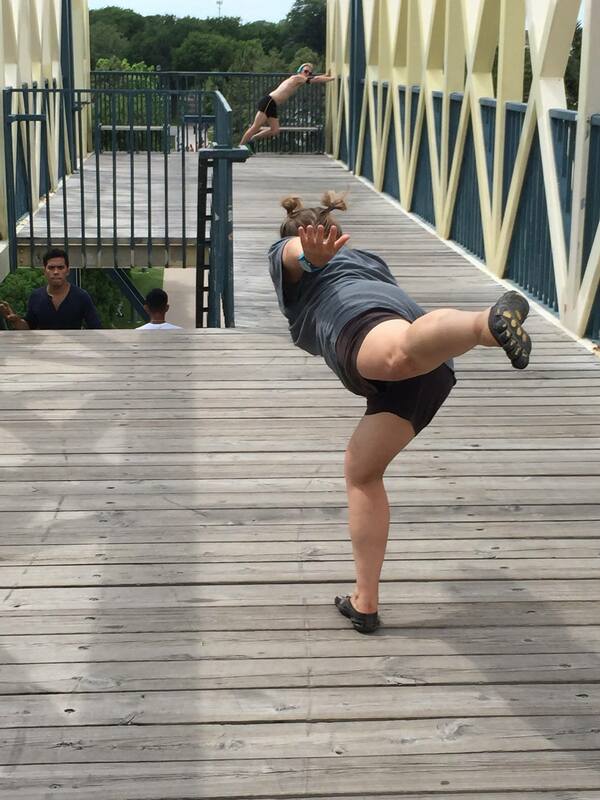 I realized how profoundly I might affect the evolution of this dance, both physically and emotionally. The moment I became a full participant, the opportunity to retreat from the dance presented itself. After dancing together around the circumference of an enclosed pavilion, alternatively pressing our bodies against the stonework façade, we came to its entrance and I darted inside. I was “safe” again. I could watch Dolo dance behind thick sheets of glass. The mediation felt like cheating. Busses full of commuters watched her too, behind their own scratched panes as they passed by. The feeling of safety quickly gave way to shame (at my own cowardice) and then that shame quickly gave way to longing—my body wanted to move again, to be in dynamic relation with this moving, brave body. I was entangled, cords of corporeal empathy dragging me out into the street. At the beginning of the performance I was clear about my role as audience and Dolo’s role as performer, but now, no more than ten minutes in, I already felt like the only ethical choice was to continue dancing. 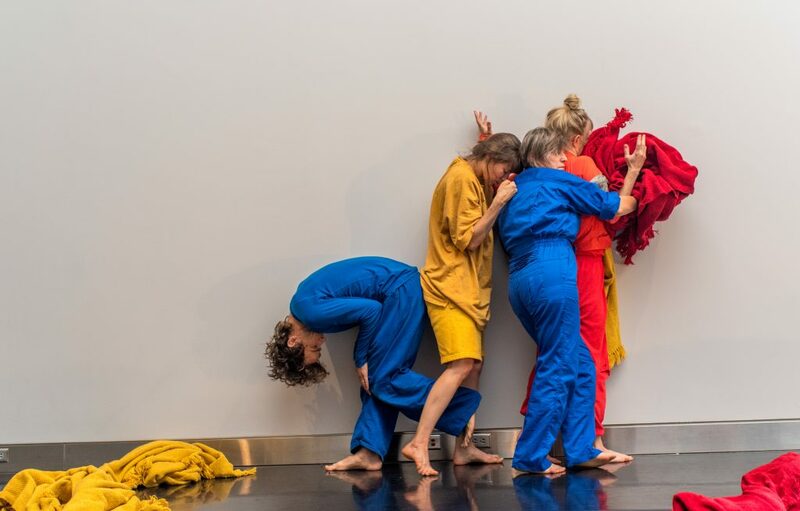 We had embarked on something together, and despite my reticence, I felt concern for the vulnerability of the lone dancing body, felt pulled back into Dolo’s orbit by an unspoken commitment, a desire to serve as impetus and counterpoint. It wasn’t always clear who was a dancer and who was an audience member. There were several people moving through the room and you had to watch closely if you wanted to know for certain if they were dancers or not. Even then, there was always the possibility that an audience member had felt called to cross the line, as that was a constant if unspoken prospect. Then all was still and Dolo rose. This time Dolo wasn’t my personal performer, but had the more difficult (comfortable) challenge of addressing and engaging the entire group at once. She again made me aware– through gorgeous, almost amphibious movements–how utterly strange and non-linear arms really are. She also highlighted the neck, that undersung marvel of attention, craning and contorting it like someone trying to locate various signals on a TV antenna. When she was done with her short solo, some of the other dancers, who had meanwhile become members of the audience, offered immediate feedback, tracing moments of impact with expository language. Then she danced again and this time the other dancers only said yes at moments where they felt moved to affirmation. Audience members began adding their own yeses. I wanted to add mine, but I was feeling a little shy and abstained. It became clear that there were five main dancers, and that some of the other dancers that had been threading the crowd at the beginning were now part of the audience. 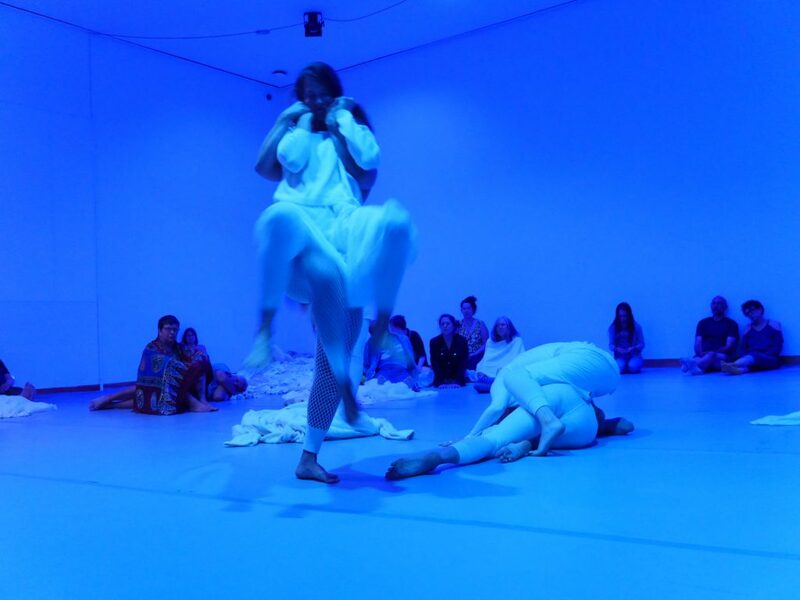 The five dancers improvised around each other, moves beginning on one body and migrating to another. It was a process of inhabiting the habits of others bit by bit until “you” became “it,” a contracting of self to seed (Inhabit, habit, bit, it, I­) that dilated back into the flower of individuation­ (I, it, tic, cite, excite). These two states continued to oscillate as the performance moved through a series of unexpected developments. I felt the dancers become inhabited by proximity, possessed by gesture, entranced by music, amused by dance, and then the lights shut down, collapsing the I to a pure vowel inside the body’s sigh. The room writhed in darkness, language and gesture brought to the floor, slithering and groaning at the horizon of legibility. Both versions of closer were profoundly de-centered. Every center was problematized, imperiled, turning the orbit of embodiment away from the traditional solar model and returning to each body its own pull, its own gravitation. The dancers gently ushered us (the audience?) into the center of the theatre. It was here that they began to dance around us in a circle, wide smiles, almost like an orbit of gratitude. I’d felt embarrassment when Dolo ran circles around me in the park, but here I felt included, held, part of a larger cohesion. The audience was the center of attention, and when off-stage curtains parted to reveal a DJ installed in theatre seats, the reveling had begun. It was a party. There would be no end to closer, there would be dancing. Chris Martin is the author of The Falling Down Dance (Coffee House, 2015), Becoming Weather (Coffee House, 2011), and American Music (Copper Canyon, 2007), chosen by C. D. Wright for the Hayden Carruth Award. He served as Writer-in-Residence at the Minnesota History Center’s Gale Library and as a Bartos Fellow at United World College. In 2011 his poem “The Small Dance” was translated by five dancer/choreographers and performed at The Poetry Project at St. Mark’s Church. In 2015 he co-founded Unrestricted Interest, a consultancy and writing program dedicated to transforming the lives of people with autism. He also teaches at The Loft Literary Center and will be a visiting assistant professor at Carleton College in 2016.